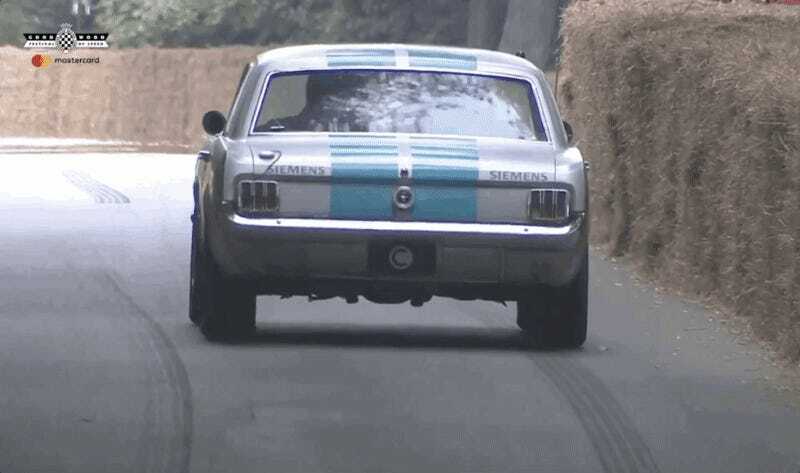 With some fanfare, Siemens announced earlier this month that it’d be attacking the Goodwood Hillclimb with an autonomous 1965 Ford Mustang. It went poorly. We finally have some explanations as to why. Here’s the full video, in case you are just catching up. It didn’t go great. The Mustang drunkenly ping-ponged across the lane, even running into the hay bails lining the course at one point. But! The Sunday Times spoke to some of the people behind the project, who explained why everything went so bad. The power steering broke, along with the fact that the whole thing was a rush job, with a masters student programming the software in less than six weeks. The car also did not use radar or lidar, instead relying on GPS, which tended to cut out when the car was under tree cover. And they also claimed they totally meant for the car to be ping-ponging, because a moving steering wheel looks better on TV. The project was a collaboration between Siemens and Cranfield University, a publicity stunt that was, on paper, intended to inspire young people to pursue careers in engineering. One irony of the whole project was that the very act of documenting the stunt may have also helped doom it. I salute the attempt for all involved, and definitely wouldn’t be able to do this myself, even given an engineering textbook and ten years in a small room, yet there also seems to have been a number of own goals in the process.